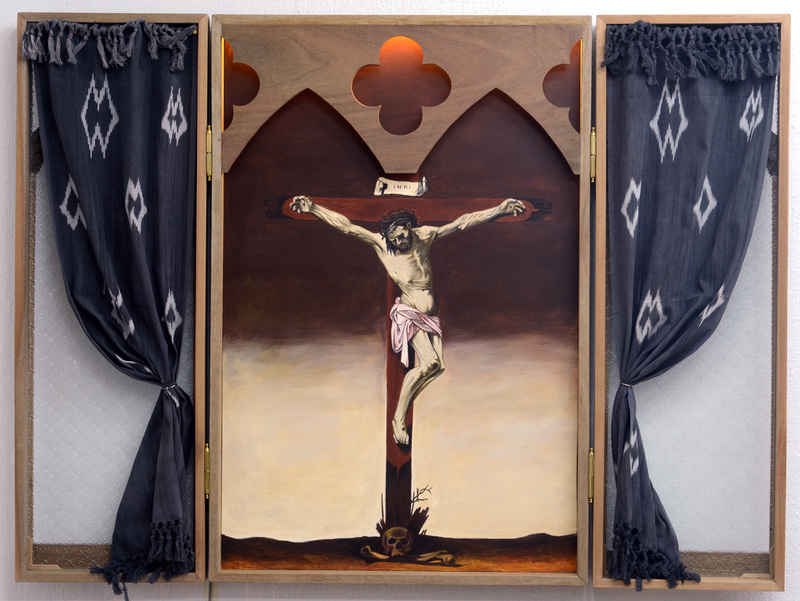 In consonance with the recently proclaimed Year of Faith (11 October 2012 to 24 November 2013) by Pope Benedict XVI, Michael Muñoz assembles works that resonate with the well-known elements of Catholic doctrine. Titled Primus Pronuntiatio (First Proclamation), this exhibition draws from the first printed edition of the Christian doctrine in the Philippine Islands dating back in 1593. In those days, Spanish mission lands customarily publish the teachings of the Catholic Church to be taught to the new converts in the native language. The Doctrina Christiana’s full title reads Doctrina Christiana en Lengua Espanola Y Tagala corregida Reglos por Los Religiosos de las Ordenes Impressa con Licencia en (San) Gabriel de las Orden de (Santo) Domingo. En Manila, 1593. The text appears in both Roman letters and the native baybayin script. Contents of the original tome include the vocal prayers—Pater Noster, Ave Maria, Credo, Salve Regina; the Articles of Faith; the Ten Commandments; the Commandments of the Church; the Seven Sacraments; the Seven Mortal Sins; the Fourteen Works of Mercy; the Confession and Catechism. 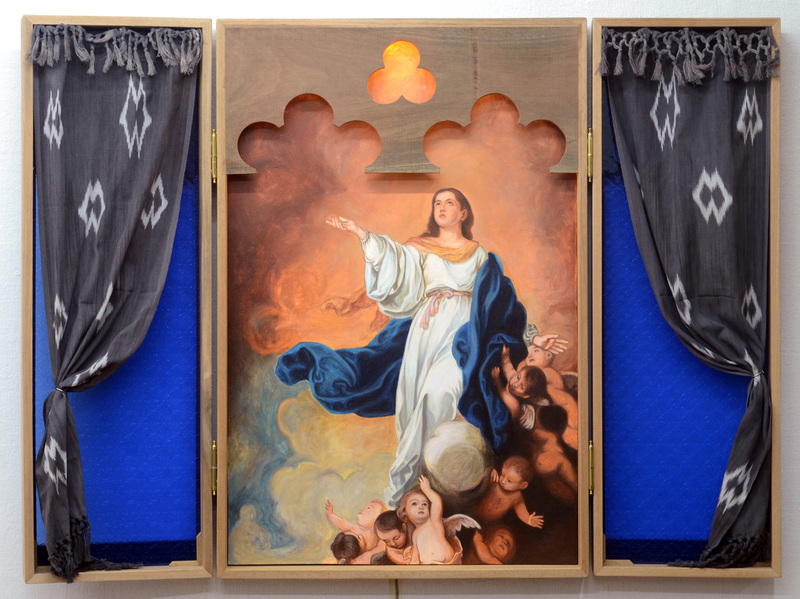 With images drawn from Caravaggio, Murillo and Brugghen, Munoz crafts his themes around such Catholic faith elements such as the Blessed Trinity, the Church, Mary’s Immaculate Conception, and the Church’s missionary zeal. Michael Muñoz studied Painting in the College of Fine Arts of the University of the Philippines. He is one of the recipients the 2012 CCP Thirteen Artists Award. 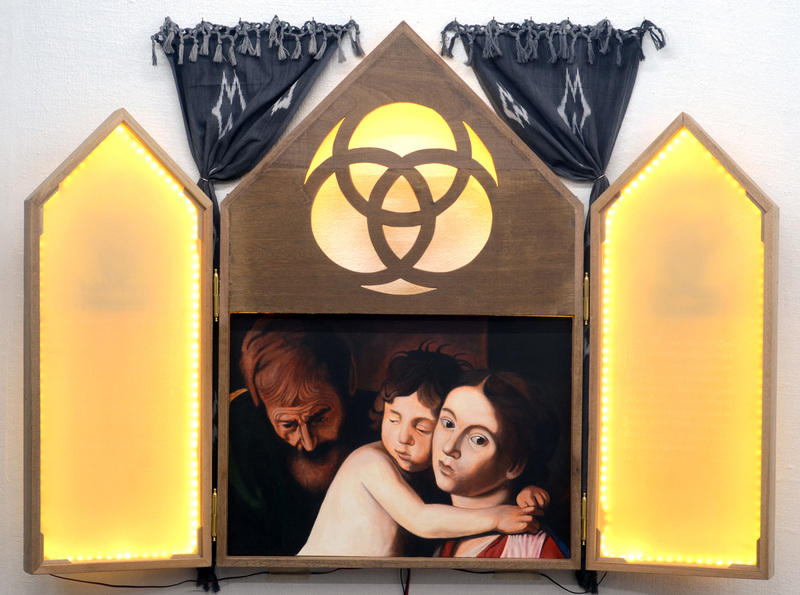 While his works are mostly on wood, he recently started collaborating with handwoven textiles weavers from L.A.B. Weavers Association based in Banaue, Ifugao.